We’re celebrating everything Irish, green, and silly with these St. Patrick’s Day fun ideas for March 17! for the kids. You can earn extra Mom points by cooking up some green pancakes; maybe even add a few of those magic marshmallows into the mix! Here’s a great recipe to try for healthy green pancakes, if the mix-from-a-box-with-green-food-colouring isn’t your speed. And if you’re looking for something more traditional, try making some proper Irish soda bread for the day. 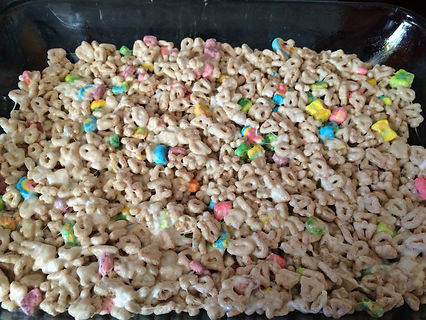 We use up the rest of the box of Lucky Charms by making Leprechaun Treats; it’s the same recipe as Rice Krispy Squares, just using a different cereal. Butter and marshmallows are all you need – and blinders to forget how much sugar you’re eating! Feeling a sugar overload just thinking about Lucky Charms? How about a Rainbow Lunch instead! 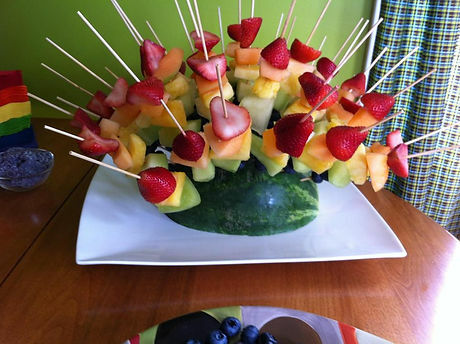 Strawberries, cantaloupe, pineapple, honeydew melon, blueberries, and grapes can be lined up for a fun feast! Another sugar-heavy but oh-so-yummy treat are these Pistachio Cookies made using Jello pudding powder; we opted for coloured sprinkles rather than crushed nuts and chocolate chips. I know one Mom who says a leprechaun leaves the magic green powder! For dinner, consider making a great Corned Beef Hash. This recipe from Kara Heald is our go-to. Some year, I will attempt to build a Leprechaun Trap Cake. Every year, I admire this one. 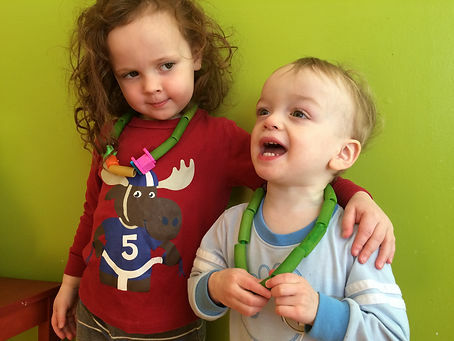 My kiddos LOVED making Green Pasta Necklaces. A drop of food colouring and a teaspoon of white vinegar made for a lot of fun! Note: you do need some time to prep this one. Place the colouring, the vinegar, and your pasta of choice in a sealed container or bag and toss it around until the pasta is covered; it’s okay if it gets a tad soggy. Spread it out to dry; I’d suggest on cookie sheets overnight. A half hour in the oven on very low heat can also work. Add some beads and yarn and you’ve got a fabulously fun fine motor skill activity. We also had a great time using various materials around the house to make shamrock shapes with green paint. 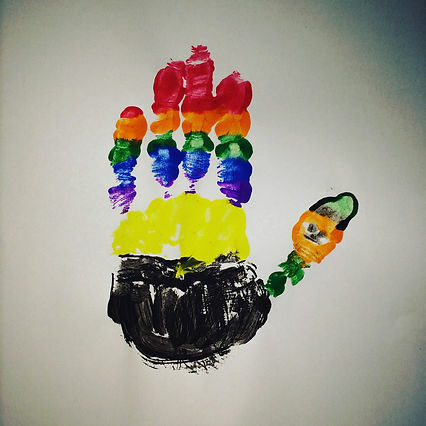 My favourite crafts are always the foot/handprint paintings. Here’s our Pot of Gold with a Leprauchan! A fun way to get everyone moving around is to hold a Rainbow Scavenger Hunt. This is great for even the littlest leprechauns to take part, as you’re searching for colours, not specific items. Maybe there’ll even be a little pot of gold coins to celebrate! If you’re planning ahead, consider a frozen sensory bin. I took beads in each colour of the rainbow, a few cotton balls, a couple of ‘gold coins’ (loonies), and some green stones (dollar store craft aisle) to create a little scene in a tinfoil pan. I filled it with water and froze it. We had lots of fun trying to decide which kitchen items – salt, baking soda, hot water, etc – would melt the ice the quickest so we could free the treasure. It was great family fun, and fits well with the idea that things are starting to thaw and Spring is around the corner. St. Patrick’s Day just doesn’t feel right without a proper Irish soundtrack! It helps that my kids’ favourite song is The Unicorn, made famous by the Irish Rovers, but written by childhood favourite Shel Silverstein. I’m often hesitant to turn St. Patrick’s Day into a silly event filled with strangely-pseudo Irish activities. For most of the last century, March 17 was a fairly solemn day that signaled the coming of Spring. Did you know that Ireland didn’t celebrate St. Patrick’s Day with all this hoopla until the 1990s? So I try to explain this to the kids, as well, while we enjoy our silliness.